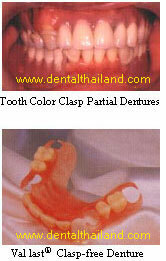 Dental Denture Bangkok, Dentist Cosmetic by Bangkok Smile Dental. As an alternative to dental bridges and implants, removable dentures can be used to replace several missing teeth. It is possible to get either full or partial dentures. Full dentures remain in place by form fitting to the gum ridges. Partial dentures often have additional ridges that fit around the natural teeth, helping them to stay in place. It may take several visits to our dental clinic in order to properly fit a denture. Our dentist will take several impressions of your gums, and send these to our in-house dental lab technicians. They will use these impressions to fabricate your new dentures. On the next appointment, the dentist will place and check the dentures to ensure that your bite is correct and that the dentures meet your expectations. In consideration, one of the significant disadvantages of dentures is the resorption of the underlying bone. The bone is normally maintained and stimulated by the stresses of chewing. When the netural teeth have been removed, the bone is no longer subject to the same stress, and therefore begins to atrophy (absorbed by the body). At Bangkok Smile MALO CLINIC, we recommend the use of dental implants instead of dentures to replace your missing teeth. Implants also replace the missing tooth roots, thus being able to maintain the same kind of stimulation/stress on the underlying bone, essential preventing bone resorption. Complete or Full Dentures replaces all the teeth in the upper or lower jaw. Dentures helps you to properly chew food, a very difficult task when you have missing teeth. In addition, dentures may improve speech and prevent a sagging face by providing support for your lips and cheeks. Overdentures are dentures that uses precision dental attachments to hold the dentures down. The overdentures attachment can be placed in tooth roots that have been saved, or placed over dental implants which have been placed in adavance. Immediate Dentures are constructed before the teeth are even removed, so that you will not be without any teeth upon leaving the clinic. Constructing immediate dentures involves taking impressions (making copies) of your mouth before the teeth are extracted. After your remaining teeth are removed, the dentures can be inserted immediately. Partial Dentures are removable dental appliances that replaces multiple missing teeth. They can be attached to the teeth with clasps (clasp or conventional partial), or to the teeth with crowns using precision attachments (hidden clasps). Both types have a metal framework with plastic teeth and gum areas. Dentures provide a pleasant, natural looking smile. If well maintained, they should be able to last up to an average of five to ten years. They can correct problems with speech and chewing, for most patients. Dentures take a little while to get used to. In the first few days, you may encounter speech problems. You may suffer from mouth irritation or sores, which are usually caused by adjusting to your new dentures, poor dental hygiene, and not removing them when needed (when sleeping, for example). You may only chew at 15-23% efficiency compared to a person chewing with their natural teeth, since the chewing force does not directly come from your bone. In the case of full upper dentures, your upper palate will be fully-covered, which may thus affect your sense of taste. If your partial dentures breaks, cracks, chips, or if any of the false tooth becomes loose, contact our clinic immediately. Do not try to fix the dental appliance yourself. Our dentist can usually repair a broken denture, often on the same day. It is especially important to see our dentist if your partial denture breaks while you are eating. This sometimes indicates that there has been a change in the fit of the dentures because the underlying tissue have changed. When our dentist repairs your dentures, your mouth will be examined as well to check whether your partial denture needs any adjustment.